Supplementary material reads: "Gershon. City desk. Illus. Awards -- Fort MacArthur. No. 1 and 2: Posthumous award of Distinguished Service Cross to Corporal Frank C. Rocha is received by his father Jose Rocha from Major General William Kean at Fort MacArthur presentation ceremonies in which four Silver stars and one Bronze Star were also posthumously awarded kin of fallen Korea heroes. No. 3: Mrs. Robert T. Blakey holds 5 1/2 months old William Arthur while son Robert Junior, 2, receives Silver Star from Major General William Kean at Fort MacArthur. No. 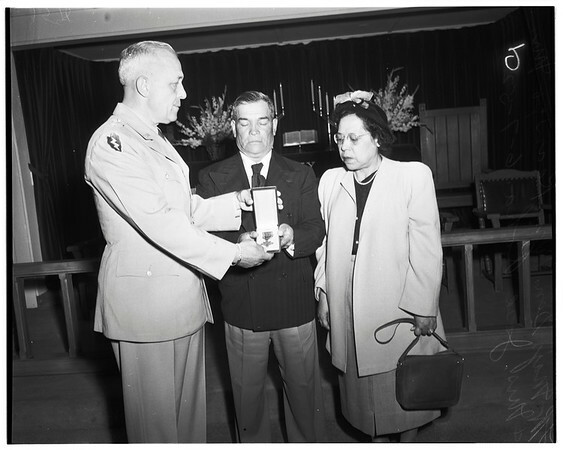 4: Major General William Kean presents Bronze Star to Napoleon M. Ortiz, father of Corporal Edmund E. Ortiz while Mrs. Ortiz sobs her grief. No. 5 & 6: Raymond Romero, 4, and Christopher Justin, 2 1/2, display different emotions as Major General William Kean present Silver Star in recognition of the heroism of their fathers in Korea deaths".